The Research Excellence Framework (REF) is the UK's system for assessing the quality of research in UK higher education institutions. The next exercise will take place in 2021. For further information about the REF please see our What is REF guide. The policy will require outputs to be deposited as soon after the point of acceptance as possible, and no later than three months after this date (as given in the acceptance letter or email from the publication to the author) from 1 April 2018. What do I need to do to? You will need to deposit your research in STORE (STaffordshire university Online REpository). For Manuscripts please deposit the Author Accepted Manuscript on acceptance of your paper. Outputs that fail to meet the criteria of deposit within 3 months of acceptance cannot be submitted to the REF. If there is a genuine reason for non-deposit within this timescale, please refer to the exceptions guidance below and send the STORE team your exceptions statement with details of your deposit. For all other research outputs please deposit the item in STORE as soon as possible after publication/creation. The above terms all refer to the version which we can accept into STORE, although it will then usually be subject to an embargo period before it becomes freely available. Embargo periods usually range between 6-24 months. The library will check this and then activate the article on your behalf. There are a few Academic Journals, which do allow the Published (typeset) version to be stored but these are usually fully accessible Open Access Journals – we will inform you if this is the case. The University has an Open Access mandate, which requests that staff and researchers upload a copy of their research into STORE. The version required is the ACCEPTED version (or Post-Print) -see below for more details. There is more information about the University Open Access policy on our Open Access support guide. N.B. Not all articles can be made publicly available straight away, if there is an embargo or copyright restrictions we will still upload the article but restrict access to University staff. 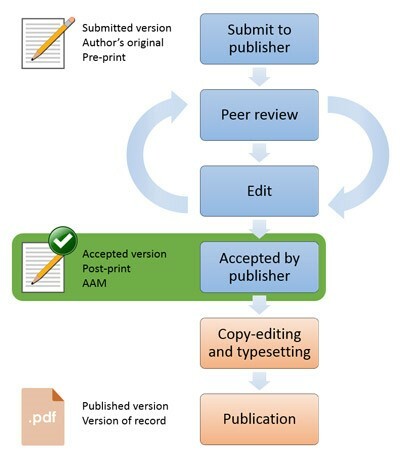 Most publishers allow the author’s SUBMITTED Version (Pre-Print) of the paper/article before peer review. Increased exposure of research via Google, RSS feeds and other search services. Digital preservation of scholarly output. Increased funding opportunities where conditions require Open Access. Enhances and promotes the growing body of free quality academic research.